1. Did you know that Craigslist is a good source for cardboard packing boxes? Just search the "Free Stuff" category for your area. 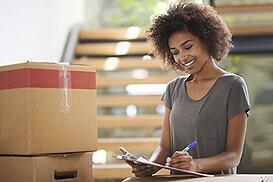 Be sure to pay it forward by listing your supplies after your own move. 2. Cut handles into the sides of cardboard boxes so they are easier to lift. 3. Use plastic wrap or zip-lock bags for shampoo, cleaning products and other items that are susceptible to leaks. 4. Organize a basket containing tape, scissors, markers, band-aids and other easy-to-misplace supplies. 5. Recycle egg cartons into "green" jewelry boxes. Simply tape shut and they're ready to go. You can also use toilet paper rolls to pack necklaces and bracelets by sliding one end through the roll and fastening the clasp. 6. Pack wrapping paper, decorations and other seasonal items in plastic bins so they can go directly into storage. 7. If you determine the layout in your new apartment home ahead of time, you can put furniture and other large items in place as you move, saving additional handling. 8. Don't risk alienating the hired help (aka your friends). Have everything packed and ready to go when they show up. 9. Have kids and/or pets? Cut down on chaos by enlisting a family member or trusted friend to baby/pet-sit. 10. You don't need the added inconvenience of getting locked out in the middle of the move. Wrap a rubber band around one doorknob, then cross it over to wrap the opposite side. This prevents the lock from being accidentally triggered. 11. Placing towels underneath heavy furniture protects floors and carpets from damage and provides an easy method to slide the pieces. 12. Wrap plastic wrap around dressers and desks. It will hold drawers closed, so you won't have to empty the contents of the drawers, making them move-in ready for the new place. 13. Cleaning as you go is a noble effort, but it's usually a losing battle. Hiring someone to clean up after you're gone is a bargain in terms of time, energy and sanity. If you like these suggestions, you will also appreciate our earlier blog featuring 11 of our favorite moving tips. This is just some of the helpful and engaging content you can find on our Springs Apartments blog as well as our YouTube, Pinterest and LinkedIn pages!